Dicrocoelium dendriticum is a species of parasitic liver fluke that infects cattle. Tissue flukes – that infect the bile ducts, lungs or liver. Blood flukes – that inhabit the blood. 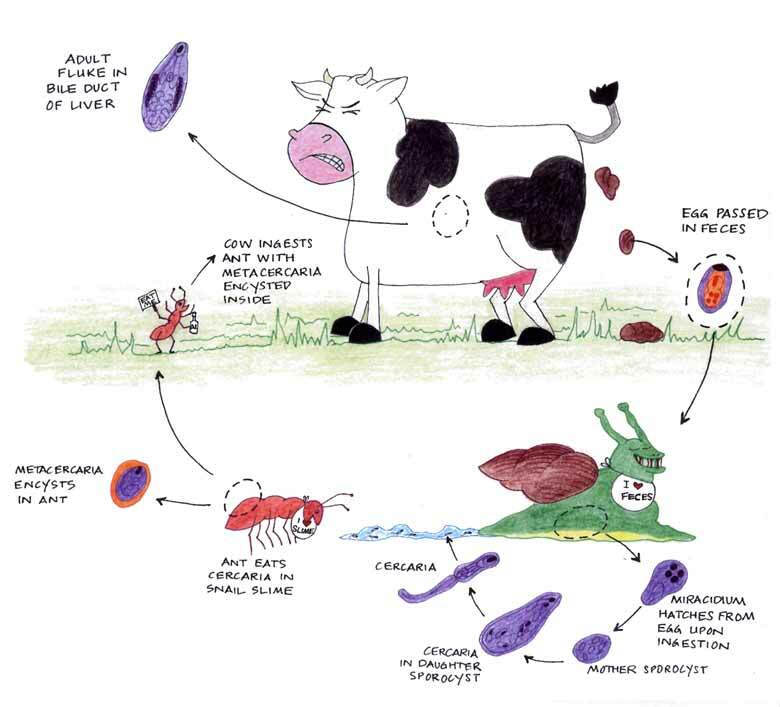 Dicrocoelium dendriticum is the lancet liver fluke. It has an amazing life cycle involving snails, ants and finally the cow. Check out the drawing below! What diseases does Dicrocoelium dendriticum cause? In large numbers adult Dicrocoelium can cause cirrhosis of liver (leading to decreased function), anemia, edema and serve weight loss. What is the treatment for Dicrocoelium dendriticum? A drug called Praziquantel is usually highly effective. It leads to permanent contraction of the parasite’s muscles, causing paralysis.